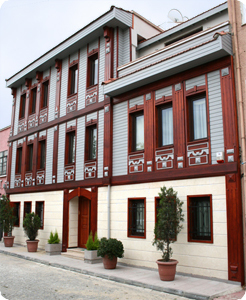 Mangana Konak is a traditional Ottoman House in the residental area of the Old City Sultanahmet. It`s quite and peaceful location close to the major sights like Blue Mosque and St. Sophia will make your stay memorable. This is one of the rare places, where you can enjoy the real Turkish Neighborhood so close to the Old City Center in one of our delightful designed Suites with a high standard of Service.